FNJ Gandaki chairman Tribhuban Paudel addressing a sit in staged by FNJ Kaski in front of DPO Kaski on Wednesday. 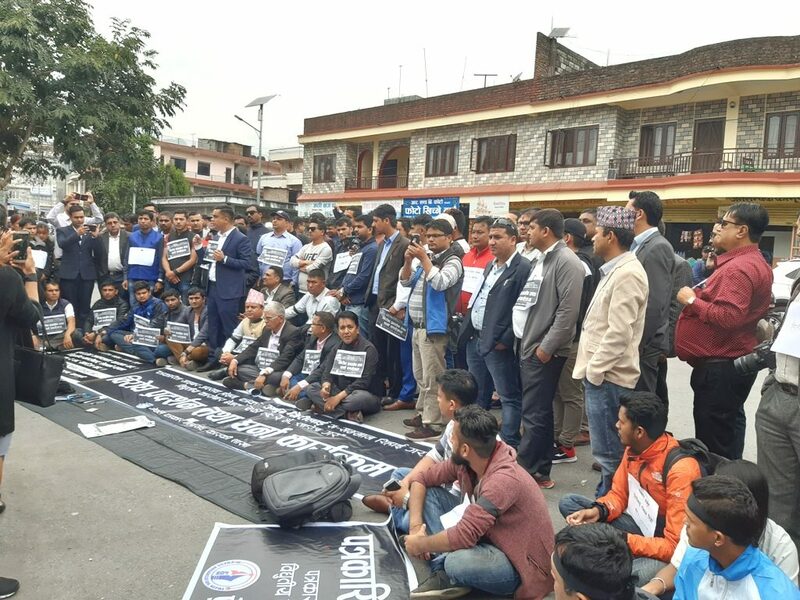 Pokhara—Federation of Nepali Journalists (FNJ) has announced the protest program, urging the dismissal of Electronic Transaction Act’s clause 47 and 48. Showing those clauses, police have been arresting journalists charging the cyber crime in various news reports posted in online news portals. Pokhara based journalist Arjun Giri is the victim of that act lately. He is now in police custody and was arrested on last Monday over cyber crime charge. 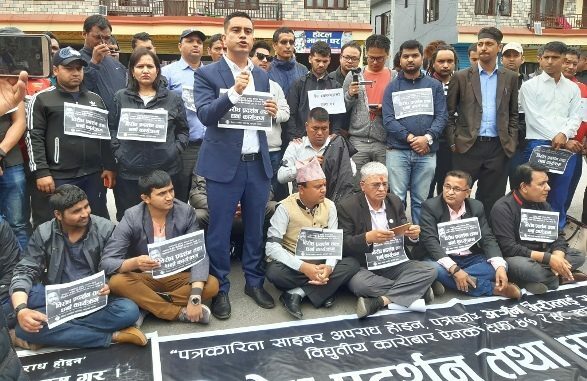 FNJ has asked all its district chapter to stage sit in programs in front of all district administration offices of Nepal from 9.30 to 10.30 am on April 18, demanding the immediate release of journalist Giri and dismissal of above mentioned clauses. Similarly, FNJ central committee will submit a memorandum to Ministry of Home Affairs and Ministry of Communication and Information Technology tomorrow. Likewise, sit in programs have been held in front of District Police Office Kaski, District Administration Office Kaski and nearby Gandaki Province Chief Minister Office this afternoon. Addressing a sit in, organizer FNJ Kaski chairman Dipendra Shrestha urged immediate release of journalist Giri. He further added that journalism is not a cyber crime. At the same time, FNJ Gandaki Province chairman Tribhuban Paudel said that the arresting journalist over the charge of cyber crime is the violation of press freedom as there is Press Council Nepal to treat such cases. Both the journalist leaders condemned the arrestment of Giri and handcuffing him. Giri was detained by District Police Office Kaski on Monday and was sent to Central Investigation Bureau in Kathmandu. He had published a news report about alleged financial fraud in his newspaper Tandav Weekly in the issue of April 5, 2019 and it was posted in newspaper’s portal tandavnews.com too. He had reported that entrepreneur Bipendra Raj Batas duped more than Rs 42m of two Pokhara based entrepreneurs- Manoj Shrestha and Janakraj Pahari. Citing that the news report slandered him, entrepreneur Batas had lodged a complaint basing on electronic transaction act against Giri in CIB office Kathmandu. Then, DPO Kaski arrested Giri on behalf of CIB and sent to Kathmandu from Pokhara on Monday. Before that Batas had taken a letter from Press Council Nepal that journalist Giri’s newspaper and portal has not been registered in that office but later that letter turned false as it had carelessly prepared. Then Giri was released overnight in the condition that he should present himself before the authorities but later he again was kept in custody. 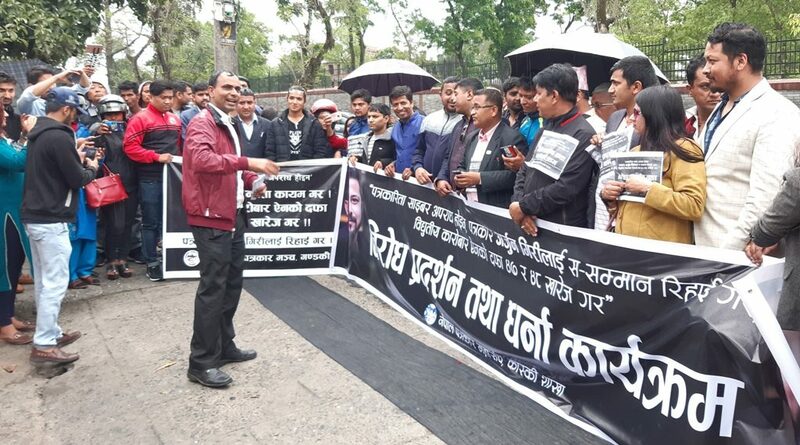 FNJ, FNJ Kaski, Freedom Forum, Press Organization Nepal Kaski, Forum of Parliamentary Journalists Gandaki, Reporters’ Club Nepal Kaski, Press Union Kaski, FONIJ Kaski, NSJF Kaski, Working Women Journalists including other had condemned the Giri’s arrest and urged immediate release of him. FNJ Kaski protest in front of DPO Kaski. FNJ Kaski protest in front of DAO Kaski. Pictures: Rup Narayan Dhakal.